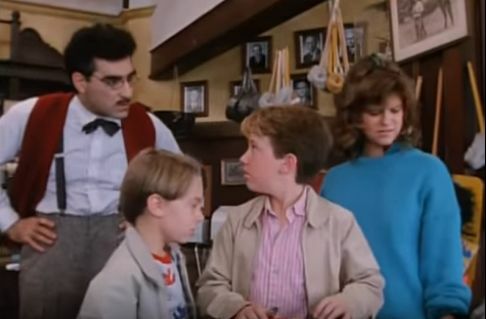 Jennifer’s brothers Aurie (Joshua Rudoy) and Corwin (David Faustino) make fun of her and her parents assure her that Mr. Boogedy is gone. However, Aurie and Corwin both have a nightmare the same night of visiting Mr. Boogedy at his grave and him breaking out of his statue. Possessed Carleton floating down the hall. The children visit Mr. Boogedy’s grave and meet gravedigger Lazarus (Vincent Schiavelli). The family also meets a swamie (Karen Kondazian) who tells them that they will see Mr. Boogedy again. During a séance to make the children believe Mr. Boogedy is never coming back, they unknowingly awaken the ghost and he returns. Mr. Boogedy possesses Carl so he can get his magic cloak and come back to life. His family is able to save him but then Mr. Lynch steals the cloak, believing it will make him as popular as Carleton. Mr. Boogedy and possessed Eloise, dressed as Maid Marion. Mr. Lynch, possessed by Mr. Boogedy, gives him the cloak and Mr. Boogedy appears at the town festival. Eloise is dressed as Widow Marion, the woman that Mr. Boogedy once loved, and Mr. Boogedy put her under his spell—which makes her hair change into Elsa Lanchester-like Frankenstein hair—and takes her with him. The family has to get Eloise back and get rid of Mr.Boogedy. The charm and fun that is the first “Mr. Boogedy” (1986) is not present in this made-for-TV sequel. Much of the cast is the same, but the actors for children Aurie and Jennifer are different. 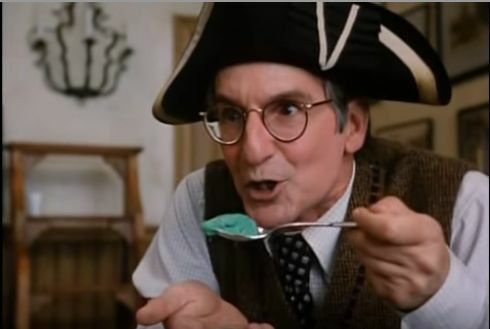 Leonard Frey as Mr. Witherspoon with spinach ice cream. John Astin who was a highlight in the first film also isn’t in this movie. Instead of Neil Witherspoon we have Walter Witherspoon played by Leonard Frey. Frey’s Witherspoon is rather odd, rather than spookily hilarious. For example, the movie starts with him telling ghost stories about Mr. Boogedy and he makes special ice cream for the festival such as spinach with bacon bits ice cream and chocolate with onion ice cream. Also, while “Mr. Boogedy” is a brisk 45 minutes, “Bride of Boogedy” is 95 minutes long. It drags with a plot that seems to struggle to find focus. The séance and Mr. Boogedy coming back is more than 30 minutes into this movie. 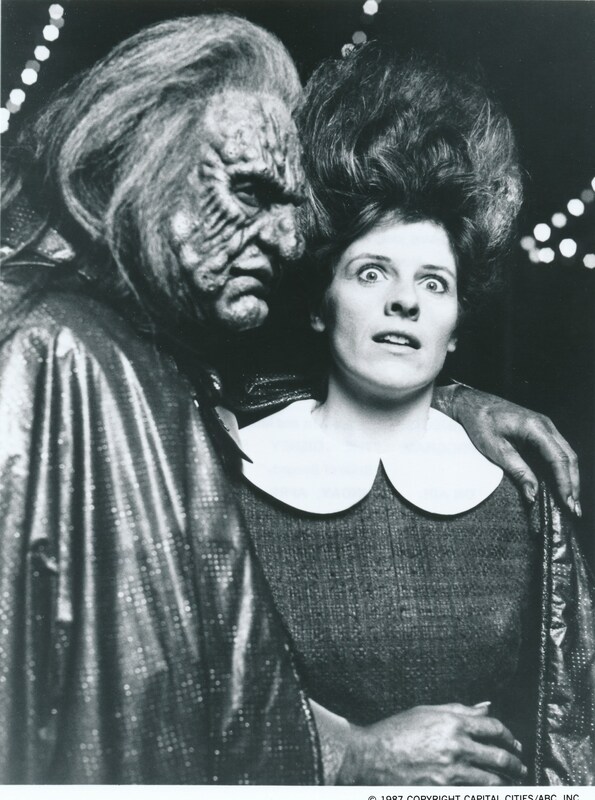 “Bride of Boogedy” still holds fond childhood memories and I remember thinking parts of it were funny as a child (like moments when Carleton is possessed by Mr. Boogedy), but the length and plot are just not as charming as its predecessor. This proves that sequels and longer lengths don’t make a better movie. This entry was posted in Holidays, Reviews and tagged Bride of Boogedy, Disney Channel, Disney TV movies, Disney Vault, Mr. Boogedy, Walt Disney by Jnpickens. Bookmark the permalink.